This is soooooooooooooo gorgeous!! I love love love the photo, the colors and those rosettes!!!!! This is just beautiful, Heather! I agree, these colours are very delish. I just love the photo you used and boy oh boy, every embellishment is just beautiful. One of my faves of yours I think, but then again, all of your pages are my faves. Looks like the cover of an exotic decor magazine. Delish indeed! 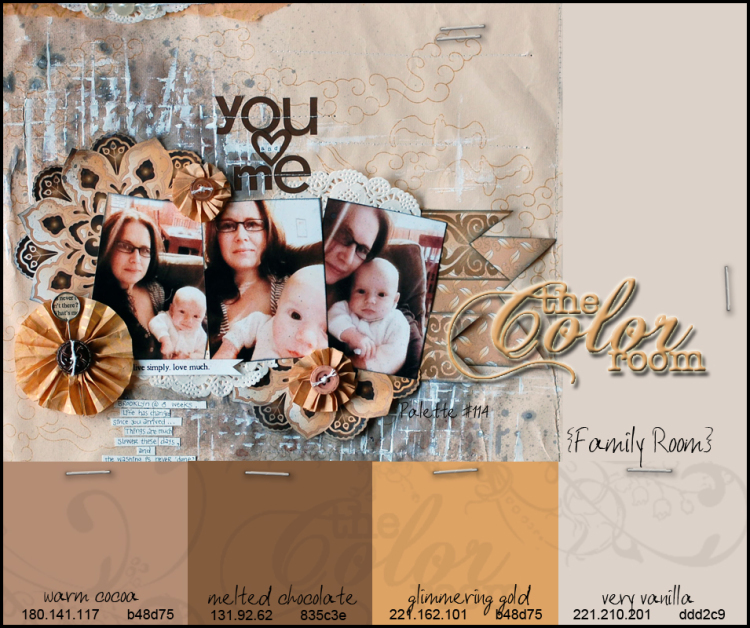 Oh wow Heather, each time I come by here I truly love what you create... this color combo is rich and rustic and the photo you have used is so homely and warm... the design looks amazing, the embellishing is stunning.. a really beautiful layout.. definitely a fav! Beautiful! What a wonderful lo for those colors! Awesome pic too! Cool aork lovely details and layers. This is just you Heather, warm, soft and kind. Love all the chippies and the rich colours. I say it each time that I see a new page of yours; this one is my fave! boy what a fab take on the palette, just so very you Heather! beeeautiful photo and gorgeous page! a little bird told me some ladies have met up with you today to go all messy and experimental, I know you've enjoyed yourselves thoroughly. Cannot wait to see what you created! Mwah! Wow, i came over to see your process and some close ups of your layout. Its stunning!